Sean’s Run from Autism, the annual 5K walk/run and 10K run, benefitting Autism Research and Resources of Oregon, is now open for Pre-registration via our online registration at http://signmeup.seansrun.org ! Autism Research and Resources of Oregon (ARROAutism) is a not-for-profit organization supporting individuals and families with Autism. Our goal is to nurture families with Autism by providing a center of resources. Historically, families have had to search high and low for services. We aim to change that by bringing resources together in one space. Today, that center exists as a first of its kind Autism Community Center on 170th Avenue in Beaverton. Our Westside Family and Community Center is open to all to rent and use for special events, and is also the site of a wide variety of Autism community social events, informational lectures, and various meetings. Our 2013 Sean’s Run from Autism is an out and back event with three categories, all of which begin and end at Historic Oak’s Park. The signature 10K run, (inspired and run by Sean – wearing bib number 001) begins at Oak’s Park, heads south on Oak’s Park Way, turns at Spokane Street to head North on the SpringWater trail, continues on the paved path, turns around near the milepost 1 marker (South of the Ross Island Bridge), and then returns along the same outbound path finishing where the race started at Oak’s Park. Volunteers and water will be stationed at the 5K and 10K turnaround points. Due to time constraints we ask that the 10K route only be used by runners who are confident that they can complete the course in less than 1 hour and 45 minutes. To sign up for the 10K run, visit http://signmeup.seansrun.org and choose the 10K Run. The 5K Run begins at Oak’s Park, heads south on Oak’s Park Way, turns at Spokane Street to head North on the SpringWater trail, continues on the paved path, turns around near the Oak’s Bottom Trail entrance, and then returns along the same outbound path finishing where the race started at Oak’s Park. Volunteers will be stationed at crossings and strategic points, including a water station at the 5K turnaround. To sign up for the 5K Run, visit http://signmeup.seansrun.org and choose the 5K Run. The 5K walk route is identical to the 5K run route. The start time for the walk route will be dependent on the number of participants. To sign up for the 5K walk, visit http://signmeup.seansrun.org and choose the 5K walk. Be aware that the Sean’s Run course is not reserved, so there will be unrelated walkers, runners and bicyclists on the course. Please walk and run no more than 2 abreast and be alert for others who may be traveling faster than you, or are approaching from the other direction. While we do our best to adhere to a strict schedule, we spring conditions and other issues may require us to make last minute adjustments to the start times. Please plan to complete registration before 10 AM and plan to be ready by 10am for the pre-run briefing. Thank you for your interest in Sean’s Run from Autism. 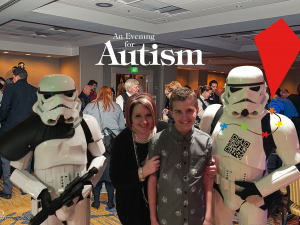 As a participant, a supporter, a sponsor, or a volunteer in any capacity you are part of a team, a community, helping to make a positive difference in the lives of the individuals and families living with Autism. We couldn’t be here without you, and we look forward to seeing you at this year’s run. Thak you, and – Have fun! This entry was posted in 2013, Sean's Run From Autism, Seans Run From Autism. Bookmark the permalink.